Are you always looking for new ways to be more efficient in your homemaking job? I know I am. There are so many things we have to do as homemakers! We have to do the cooking, the cleaning, the laundry, making lists, doing paperwork...the list of our tasks goes on and on. I like to find new ways of doing things and try to improve upon them. One of the tools I enjoy using is the Motivated Moms planner. It is basically a chore planning system that helps you know what to do each day. It really takes the load off of thinking what tasks you need to do every day because it's already been thought out for you. 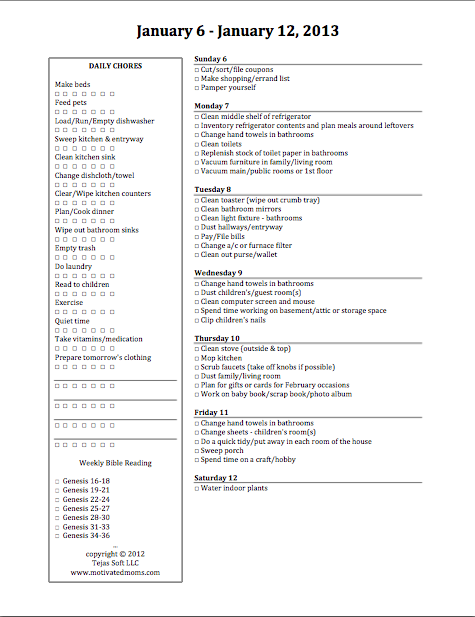 The planner has sheets that you print off with check mark boxes to check off each time you complete a chore. The planner is a full year of chores. You can either print it off all at once or print the pages as you need them--it's up to you! There are chores given for each day of the week for every calendar day of the year, plus chores that you do every single day, week after week. When you've completed a chore, you can just put a check in the box next to it! There are several planners available, depending how you much information you want on each sheet of paper. 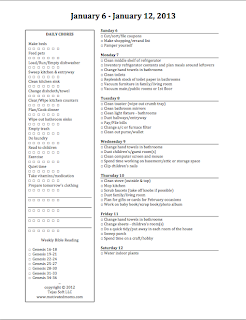 There are even planners available with a daily Bible reading plan (also with check mark boxes to keep track of what you've read). For 2013, you can even get the Motivated Moms planner for many portable electronic devices such as the iPhone and iPad. To see all the different planners available, along with sample sheets, go here. And now, for a special offer for my readers. From now until January 2, 2013, you can get $2 off your purchase of the Motivated Moms planner eBooks! Just enter the coupon code BLESSED when you check out.